Rather than extending the tax rates only on income described by Democrats as middle class — up to $250,000 a year for couples and $200,000 for individuals — the deal would also keep the rates for higher earners, probably for two years. re-election bid, because they see it as politically helpful to them in painting Republicans as defenders of the rich. 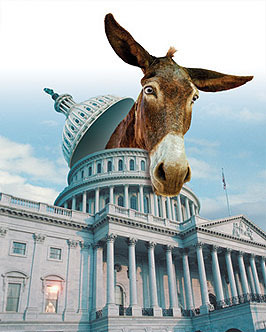 The debate, of course, could cut the other way, with Republicans again portraying Democrats as seeking to raise taxes. You know, I’m in a foul mood lately. And that means maybe I overreact to stuff a wee bit sometimes, though I try to keep the blog on a more or less even keel. But it’s getting harder every day. I mean, WTF? What in God’s name are the morons who pass for leaders of the Democratic Party thinking? If they’ve finally backed themselves into a corner where they’re forced to extend all the Bush tax cuts, then OK. I’m resigned to it. But they’re seriously planning to extend the tax cuts for two years, even though that means restarting the fight during the 2012 campaign season, “because they see it as politically helpful to them in painting Republicans as defenders of the rich”? And they think this why? Because they all stuck together so well this time around? Because they wowed the American public in 2010 with their argument that Republicans were defenders of the rich? Because two years from now centrists and Blue Dogs will suddenly decide to grow a spine in the face of tea party competition? Because they think Republicans will cower in fear and Fox News will suddenly embrace sweet reason the next time Democrats try this tack? Because they think that vilifying the rich only failed this year because it was so soon after an epic financial meltdown caused by the rich? Because they’re not as smart as a pair of New York Times reporters, who immediately understood that, yes, perhaps Republicans would have some modest success “again portraying Democrats as seeking to raise taxes”? I dunno. Someone help me out. Am I missing something? Is there some reason to think that Dems are going to wage this battle any more effectively in 2012 than they did this year? Or is this every bit as addlebrained as I think it is? POSTSCRIPT: I almost forgot the constructive criticism part of this post. Sorry about that. Here it is: if you’re going to extend the tax cuts, extend them for three years. Let’s have this conversation next in 2013, OK? POSTSCRIPT 2: The only non-moronic spin I can think of for this strategy is that 2012 is a presidential election year, not a midterm. And somehow, Barack Obama’s silver tongue will carry the day in a way it couldn’t when he himself wasn’t campaigning. That is, perhaps, just barely plausible. But I sure wouldn’t bet the ranch on it.